We posed the questions below to the quality community, and seasoned professionals replied with some insights into why they pursued an ASQ certification and provided helpful advice on exam preparation. For more information on ASQ Certification, visit asq.org/cert. How did you decide which ASQ certification(s) to pursue in light of your career goals? I am preparing for the CQE exam this December. I was thinking between CQE and CQA, but in my current job I think CQE is more beneficial for my career growth. However, I have a goal to pass the CQE exam, then next year on June I am going to get CQA as I am an auditor as well as a quality engineer. Wish me luck! – Chananchita C.
I did CMQ/OE in 2010. This was useful for my career in projects quality. – Ashwani K.
I first went for the CQE certification as my employer would reimburse and it was tied into a promotional opportunity. I prepared by taking the prep course through the local ASQ chapter and a lot of intense studying. Later I went for the CQA as it also was sponsored by my employer and thought it to be complementary to my profession. I found both to be worthwhile, but the CQE preparation was certainly a much more intense experience as it was imperative to pass first try. Proper preparation prevents poor performance! Good luck. – Brian L.
I have two certificates with ASQ. One can decide to embark on any ASQ certificate based on the role he/she plays in the organization or where you see yourself in future. I decided to go for ASQ CMQ/OE since I report directly to QAM, and also assume his role when not around. Because I wanted to handle the position very well and make myself available for related roles, I embarked on CMQ/OE. ASQ QA will give me a wider opportunity than only being certified by my organization. – Nkwachukwu O. Based on my experience as Statistics Division Certification Chair, the top two ASQ certifications for our members are CQE and SSBB. This is why we offer these two, among others, at the Special Certification Exam Administration we sponsor at Fall Technical Conference (this year in Minneapolis). I decided to become CQE because it had more of a statistics focus. – Brian S.
I started as an NDE technician, and while ASTM and ASNT provided a good guide for NDE, as I was assigned more QC and QA responsibilities, I wanted to find a good source of knowledge regarding best practices for creation, implementation, management and improvement of quality related functions. I found that ASQ (and PMI) are excellent sources of best practices, applicable and proven in a myriad of industries and countries. The only downside to real knowledge is that you become much more aware of how often projects fail due to bizarre practices implemented by managers whose skill set is limited to “shout, curse, and threaten”! – David S.
I decided the type of certification based on my experience and foundational knowledge gained through undergraduate studies. I solved lots of question banks. It’s important to understand the content thoroughly for a successful pass on an exam. Exam questions are tricky but are doable if one has full knowledge. ASQ certifications are worth having for a quality professional. – Yogesh S.
I found the ASQ’s sequence of classes to be very useful because it focuses on different career paths. – Isaac T.
I aspired to career roles in Quality Management and looked to build a diverse professional portfolio. – Daniel Z. For preparation, it is recommended to go through the QCI primer or ASQ Handbook again and again. For comprehensive understanding, watch available materials relevant to certification on YouTube. Read and practice as much as you can, especially for statistics. Time management is key factor for ASQ exams, so during study it should be considered. – Muhammad I.
I used ASQ web training and ASQ handbook for CMQ/OE. – Ashwani K.
For several of my certifications I took the refresher course offered by our local ASQ chapter and others, and I forced myself to use the same training methods at home. Now to retain some of my certifications (CQE, CQA, CCT) there are requirements, whereas some of my certifications (CQT, CQI which was CMI then) are lifetime certifications. – David R.
I read at least two books based on searching the reviews on Amazon, and then bought training material to simulate questions–not for exam per say, but to mimic real life situations. As my field is not quality management, the questions let me face situations that quality guys face in real life. Exams are good because they force you to study and be serious about your learning goal. All self-funded… worth it though. 🙂 – Azmat S.
I took many excellent classes offered by the Akron-Canton chapter if ASQ. As a woman, it was very difficult to be hired in engineering despite my degree, but it opened doors as a quality engineer. – Renee S.
Preparations for ASQ certifications were extensive and combined self-study, research of the ASQ back issues of journals, attendance at Section refresher courses (primarily for statistics), and subscription to the pertinent ASQ divisions. I recommend the same for others, particularly joining and participating in ASQ Divisions. – Daniel Z. What advice do you have for those thinking about pursuing an ASQ certification? Share your experience in the comments! If studying and preparing for the CQE exam, then use the same books and reference materials as recommended or even required for the CQT – including the ‘Quality Technician Handbook’ – any edition. In fact, if one can study, prepare and pass the CQT – then the CQE preparation, coursework and exam is very similar. 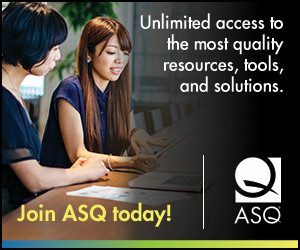 ASQ has some excellent resources available, particularly the Question bank. I have summarized this in my own blog and encourage all those pursuing ASQ certifications to look within ASQ first for their resources. I also recommend to moderate the training costs per certification and explore the pursuit of multiple ASQ certifications. This will have more benefits in the long run. Previous Previous post: What Do We Expect from Senior Leaders?